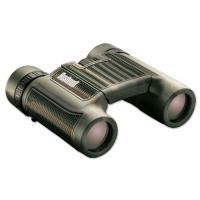 Bushnell's H20™ binoculars are in high demand for a superior on-the-water sightseeing experience. Now enhanced with a Soft Texture grip to ensure they remain on board and in-hand during the most difficult weather conditions. The H20™ binoculars are also O-ring sealed and nitrogen purged so you're able to view the most breathtaking scenery despite how wet conditions may get. Standard equipment includes premium quality BaK-4 prism glass as well as multi-coated optics to ensure you get superior clarity and light transmission. No matter where you are, the world is guaranteed to look better when you're peering through the Bushnell® H20. Easy to carry and ready for all of your wet-weather adventures, these are a great choice.